This model has had a stimulus protocol added to it to allow simulation of action potentials. Unfortunately, the details of the stimulation defined in the original paper are not known and as such, the parameters of the stimulus (magnitude, duration, dimensions,) may not be appropriate. Currently, however, the model runs in PCEnv and is able to simulate a train of action potentials. COR will not currently run this model. ValidateCellML detects unit inconsistencies within this model. IL , a leak current. The style of the model equations is based on the The Hodgkin-Huxley Squid Axon Model, 1952. However, the authors acknowledge that the situation in striated muscle is complicated by tubular resistance and capacity. The transverse tubular system which exists in striated myocytes is represented in the model by a linear resistance and capacity in series. 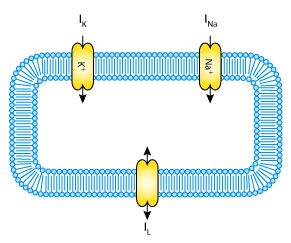 A schematic cell diagram describing the current flows across the cell membrane that are captured in the Hodgkin Huxley model. Derived from workspace Adrian, Chandler, Hodgkin, 1970 at changeset cdf8973b740d.